This is the final stage of this painting in progress. Here is a detail of what the focal point looks like so far. I wanted to warm it up a little so I glazed some New Gamboge, very wet, over the area of the river bank, the greenery and the lily pads. 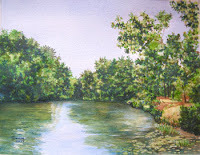 You can see how the glaze added warmth and life to the foreground and riverbank. Now it looks more like the sun is shining on it! Below is the finished project! If you enjoyed this project, there is more to come. Click on the link at left to become a Follower! Thanks so much for visiting! Another project will be here soon.